The Suquamish Tribal Library serves the Suquamish community by providing learning tools to students at Chief Kitsap Academy (CKA) and Tribal Members. Services at the facility, located on the second floor of the school, include resource programs, children’s workshops and mentor programs. 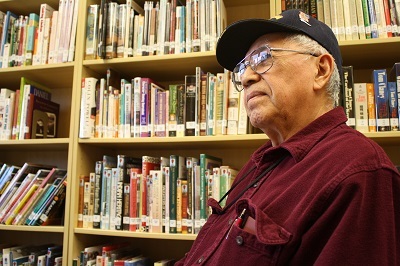 Suquamish Tribal Elder Rich Demain at the Library. Find great books for recreational reading and research online! A comprehensive list of online resources to help complete any research project. The Suquamish Tribal Library manages the Chief Kitsap Academy (CKA) Mentor Program. The program partners CKA students with mentors in the community. Mentors and students meet regularly and participate in a number of community-based events. Each month, a program lunch is held at the CKA, with average attendance last school year of 89 students, mentors and staff. The program has held additional monthly special activities for the mentors and their mentees. These included theatre, concerts and professional sporting events, all with an average attendance of 20 people. The objective of the program is to expose students to new experiences and to help them learn how to relate to adults in various social situations. Additional goals for the program include increasing student independent reading for pleasure, positive perceptions and behavioral changes in students about coursework and school attendance, increasing engagement between mentors and students, and state-wide access to the student produced blogs and Elder Stories in the Suquamish Museum Digital Archives. Suquamish Tribal Archives are housed at the Suquamish Museum.